I’ve been meaning to write this for a while, but time is so precious at the moment I’ve never found a spare half-hr. But on today’s ride, a 5.5 hour slog that should have taken 5 hours, I had ample time to reflect. Dragging myself out on a 5 mile brick run, when every ounce of me just wanted to lie down in the garden and sleep, I tried to remind myself why I do this. I tried to remind myself that the sun was shining; that I don’t have cancer; that I may not really want to be running right now but I do want to still be racing Ironman; that ultimately, 5 miles of plodding won’t kill me but I’ll draw on today next time I’m suffering in a race. And that my run is finishing in Sainsbury’s where the shelves would be my oysters! The benefit from today’s 6hr session wasn’t really physical but mental. Anyway, I got back to see my rapstar friend Paul Shanley had punctured twice in a race and ran the last 6km of the bike leg so that he could do the run. Which prompted me to finally write this. ‘Why I don’t believe in DNFs’. My first pro-win was in 2011 in Ireland 70.3. I’d gone part-time at work the day before the race so it felt like the start of being serious at triathlon. 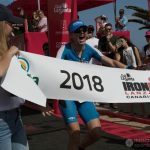 It was a tiny field but with Rachel Joyce on the start list (who finished 4th at Kona a few weeks later), it was only ever going to be a race for second. Except it wasn’t. I had a blinder. She had a tough day. And against all the odds I won. I learnt a lot that day; to believe in myself and not write a race off before the start. But most importantly I learnt how to lose. Rachel had clearly had a tough day out there but she didn’t make a single excuse. A ‘nobody’ had beaten her. Most people would blame their bike or their ‘training block’ or illness or their gut. Rachel just congratulated me and then let me use her room to shower, helped me pack my bike, helped me find the organizer to explain that I couldn’t stay for the awards as I had to get my flight back to go to work the next day and then congratulated me again. I vowed then, that if I ever became a ‘name’, when I had a bad day I would try to be as gracious as Rachel. Since then I’ve had my fair share of tough days. I walked 21 miles of the marathon in my first world championships as a pro. I finished last pro, but I still finished when many didn’t. I’ve raced with a chipped elbow when I couldn’t get on the tri bars. I’ve raced ill. I’ve raced with a torn Achilles. I’ve punctured. I’ve got hypothermic. I’ve just had days when I felt empty. But touch wood so far, I’ve never DNF-ed. A bit of me doesn’t want to write this as I feel as though I’m tempting fate. But my point is, no matter how bad your day is, personally, I don’t believe in DNFs unless you’re making yourself ill or an injury worse by getting to the finish line. Firstly, if you pull out, just because things aren’t going to plan, in my book you’re being disrespectful to the athletes ahead of you. You owe it to them to let them beat you, rather than pulling out with an excuse. As an up and coming pro I hated it when people pulled out so I couldn’t tell myself I’d beaten them. 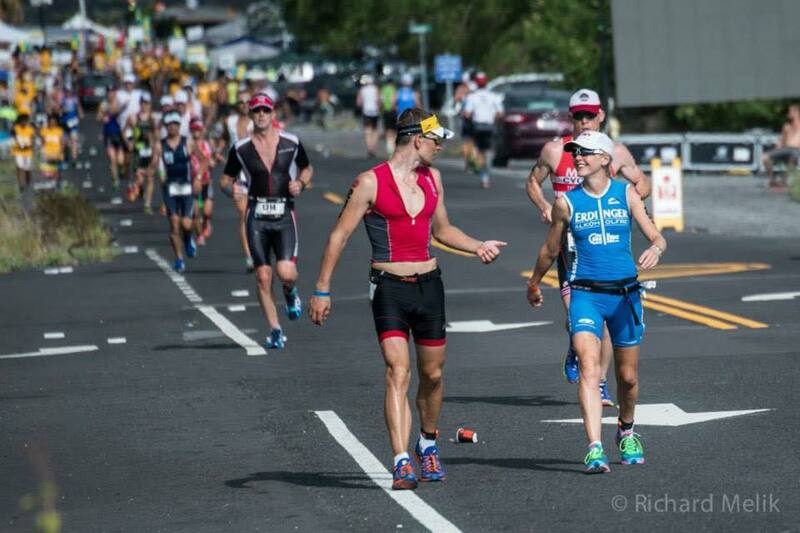 Jan Frodeno and Andy Raelert both walked to the finish in Kona. By doing so, they showed respect to their competitors and respect to all the other athletes racing. And secondly, once you pull out once, just because things aren’t going right, I think you open a door in your brain that makes it far easier to pull out in the future. Ironman is a super long day. You can have a rubbish bike and then feel great on the run. You can feel shocking for 20 miles of the run but then turn it around in the last 6. Or you might just feel rubbish all day. Or you can pull out and ask yourself what might have happened. I know what I’d rather do. You just never know unless you finish. If you’ve pulled out once on a bad day I think it’s all too easy to give up again. Staffs this year was a day where I felt like quitting. I felt shocking and was way off the pace. Yet actually, I think I got more respect from the crowds for finishing and running (just about) the whole 21km than I did when I won it the 3 years before. It’s easy to suffer on a good day, far harder on a tough day when you’re so far behind you’re not part of the race. But these are the days that make you strong mentally. And looking back, I’m probably more proud of that finish than I am of my win in Bolton a few weeks later, when I had such a big gap to second that I didn’t really need to suffer. glory sessions every now and then but it’s the consistency and the ability to ignore your power and speed, switch off and just grit it out on a bad day that makes you good at Ironman. So next main focus for me is Ironman Wales. 5 weeks to the race. 4.5 weeks to my exam. And I really hope this is my final ever exam. I’m too old for them! It’s funny but to me, the fact that I do have this exam 4 days before Wales is exactly why I’m pumped for it. It’s added an extra element of challenge. 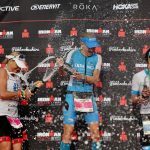 As someone said to me the other day, Ironman Wales on it’s own wouldn’t be exciting. And to some extent, that’s true, no matter how much I love the race. The exam makes the build up more challenging and hence the finish-line more rewarding. I really hope I make it!